Childbirth is often regarded as a miracle, but it took new meaning for this cancer survivor, who has become a mom four times over within months after suffering 17 miscarriages in the past. "I was just enjoying my life and suddenly, within nine months, it turned crazy," said Lytina Kaur, 32, of Nottingham, England. "In the end, we were really lucky." Lytina Kaur says before her four daughters, between the ages of 6 months to 16 months, she and her husband had nearly given up hope on having kids. Kaur is a cancer survivor who became a mom of four within just months after having suffered 17 miscarriages. She was told she would never be able to have kids due to chemotherapy and treatment for her cancer, as well as the bone marrow transplant. But despite the doctor's warnings, she and her husband attempted to start a family of their own. 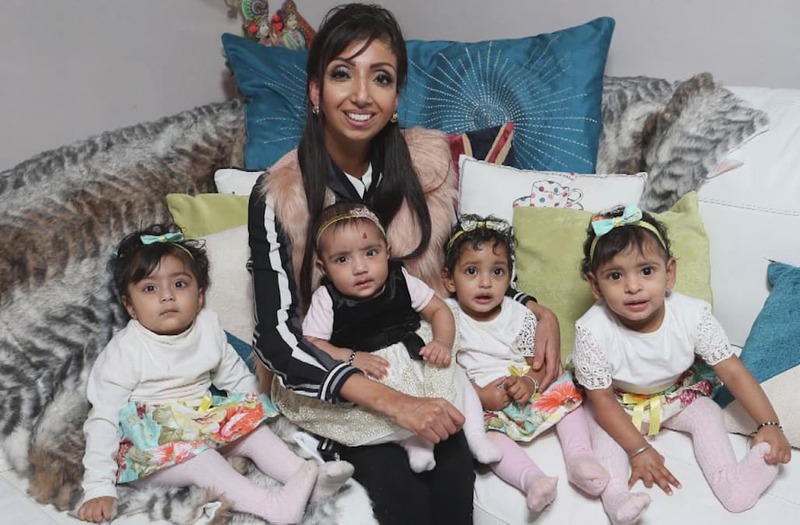 Kaur explained in an interview with SWNS that before her four daughters, between the ages of 6 months to 16 months, graced her life, she and her husband had nearly given up hope after 17 miscarriages over the years. She said she was diagnosed with myeloid leukemia when she was just 17 years old. She was told she would never be able to have kids due to chemotherapy and radiotherapy treatment for the cancer, as well as the bone marrow transplant, but, "I didn't think about it too much at the time, and thought I'd worry about it when I crossed the bridge," Kaur said. However, when she married at 23 years old, she finally understood the consequences. Despite the doctor's warnings, she and her husband attempted to start a family of their own, but suffered 11 miscarriages. The couple then looked into IVF, but those attempts were also unsuccessful. Next, Kaur and her husband looked into surrogacy in India, yet each of their six attempts to implant an embryo also ended in miscarriage. "It was heartbreaking," Kaur said. Just as the couple was about to give up, Kaur said she got pregnant in February 2015 with her first daughter, Kiran. "Every day was so hard," she said. "I didn't tell my family. I didn't tell anyone. I didn't want people to get excited for a miscarriage to happen again." During her pregnancy with Kiran, her surrogate mother had also become pregnant with twin girls, Kajal and Kavita. Despite her concerns, Kiran was born healthy via C-section in September, and her twins were born in November of that same year. Not long after, Kaur found out she was pregnant again, and eventually welcomed her fourth daughter, Kiyara, into the world. "Luckily, I've got my mum and she's pretty hands on," Kaur joked, when asked about her rapidly changing life. She explained that while she often misses being able to go out when she wants, she's happy to be a stay-at-home mom and to spend time with her daughters, even though she goes through a pack of 82 diapers within days. "My life is devoted to the children now," Kaur said. As Janet Jackson Gives Birth, Does She Have a Secret Baby Born More than 30 Years Ago?